The most frequent combinations are "trios" and "pairs". Trios are made up of one or other of the 1914 or 1914-15 Stars (they could not be awarded together), the British War Medal and the Victory Medal. 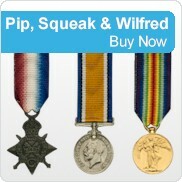 The three medals were sometimes irreverently referred to as "Pip, Squeak and Wilfred". Pairs are generally for servicemen who joined the war after 1915, and are the British War Medal with the Victory Medal. Merchant seaman were entitled to the Mercantile Marine Medal (issued by the Board of Trade) and usually the British War Medal as well. The Territorial Force War Medal was awarded to members of the Territorial Force and Territorial Force Nursing Services who served overseas; it is the rarest of the five Great War medals. Campaign: First World War 1914 Branch of Service: British forces Description: A crowned ..
Campaign: First World War 1914-20 Branch of Service: British and imperial forces Descri..
Campaign: First World War 1914-19 Branch of Service: British forces Description: (Obver..
Pip, Squeak and Wilfred were characters in a comic strip which first appeared in the "DAILY MIRRO..